When I started my fiction writing career, I thought point of view and viewpoint referred to two distinctly different things. They both, essentially, refer to an attitude or a way of thinking about a particular subject. We use viewpoint to talk about a person’s individual attitude about things. 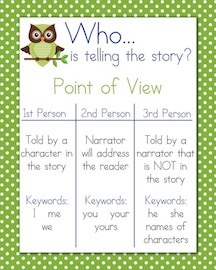 In fiction, point of view (POV) is used to tell from whose perspective we will hear a story. Put another way, POV focuses on the type of narrator you use to tell your story; viewpoint focuses on how this narrator perceives what’s happening within the story. There are the four primary POV types in fiction: first person, second person, third person limited, and third person omniscient. (1) In first person POV, the story is limited to what the narrator of the story personally hears or sees, or what someone else tells the narrator what happened when the narrator was not there. (2) In second person POV, the story is told to “you.” Second person POV is rarely used in fiction nowadays. (3) In third person POV limited, the narrator only knows what one character feels or knows. Thus, this POV can be just as limiting as first person POV. (4) In third person POV omniscient, the narrator sees, hears, and knows what more than one character sees, hears, and knows. Another way to explain POV is first person POV is someone telling you his or her story; second person POV is you being told how you should do something; and thirdperson POV is more like a camera recording events. But, depending on the narrator, third person POV may or may not be an objective POV. Third person POV omniscient is the POV that most fiction authors use today. Regardless of whichever POV you choose to write your story, there are some things you should consider. Foremost, start your story with your protagonist. Within that start, set the main story question within your first paragraph. Thereafter, each scene in your story should be a part of your story question. Some writers believe the maximum number of viewpoints in a fiction novel should be two main character viewpoints and two minor character viewpoints. They also believe the fewer viewpoint characters that are in your story, the stronger your story will be. If, however, you do have multiple viewpoint characters in your story, each character needs to have their own arc in the storyline. You’ll also need to make certain to not shift character viewpoint within a scene. A particular pet peeve of mine occurs when I read a book with multiple viewpoint characters and the voice doesn’t change with what we know about that character’s age, social or economic level, or even their gender. So, keep in mind that every time your viewpoint character changes, your voice must change to match what we know about that character. Deciding what type of POV narrator will tell your story should be one of the first decisions you make about what story to tell.